Following on the release of their catchy and addictive new single “Easy”, Sunshine Coast-based indie-pop quartet Selahphonic just premiered a funny and creative DIY video to go with it! You can also download the track for free! We pondered for quite a while on what to do with an accompanying visual to ‘Easy’. It’s a song about perseverance so you would naturally assume a deep and profound narrative would be appropriate; however, in the end the creative think tank just wouldn’t click. With the self-directed video for their catchy track “Easy”, Selahphonic depict the emotional journey of a sales-yard inflatable! 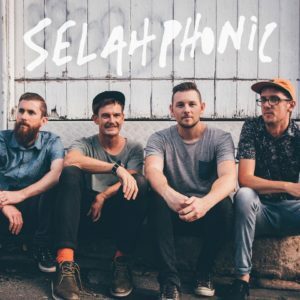 Selahphonic, which comprised of Jamie Coyle, Tim Doecke, Joel Boldero, and Dave Meikle, will bring their four-to-the-floor indietronica pop tracks on stage in WOLLONGONG (RAD BAR – October 7) and SYDNEY (OXFORD ART FACTORY GALLERY BAR – October 8). Meanwhile, you can download “Easy” for free via their official website! Connect with Selahphonic on Facebook, Twitter, Soundcloud, and Instagram!